Finding out about an update can be a little tricky: on my iPhone, I do get notifications of upgrades / updates and it is easy to just tap an icon or two, the update installs, and I move on with life. With the Fire, however, it can be a little tricky to see if you have any available updates – the original Kindle Fire used to be easy, but with software upgrades to the Fire’s operating system, the release of several new versions of the Fire, I’ve found out the hard way I had available updates that needed to be installed. Sometimes the apps update automatically, sometimes the apps send you a notification if you would like to update, and sometimes you just don’t know unless you know how to check it manually. All that being said, and assuming you want to manually check and see, how do you find out if you have updates available to your aps and how do you install them? • Turn on your Kindle Fire, and make sure your wireless feature is on. • From the Home Screen, tap the “Apps” icon at the top of the screen. • Tap the “Store” icon in the upper right-hand portion of your screen. • Tap the menu icon at the bottom-center of your screen if you have an older Fire (it looks like a representation of a piece of paper to me, or a box with three horizontal lines) or the top left or bottom right if you have a newer Fire. • Tap the “App Updates” option on the new pop-up menu. Who knows, you might be surprised at what apps have been updated and are available? • Tap the “Update” icon to the right of the app(s) you would like to update. • If the previous version of the app is still on your Fire, you should receive a warning message it can’t update unless you remove the previous version. To install the new version, you must remove the old version. 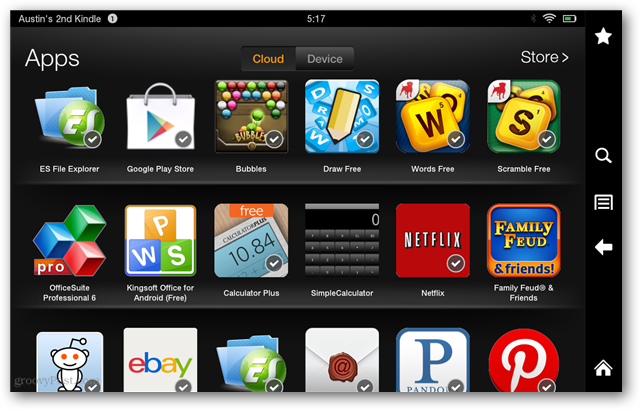 Which Kindle App Do You Need?